John joined us during our junior year at Darrow. He was my chemistry lab partner that fall (maybe Horton Durfee thought I’d be a good influence on him, goody-goody grind that I was). So I got to know him fairly well. For our senior year, John, Joe Coffee, Frank Rosenberg and I had planned to room together, in Hinckley House. We got split up into two doubles—Joe and I in one, Frank and John in the other—but still saw a lot of each other. Frank says he suspects that the administration placed him and John together so Frank—up to that point a model citizen—would be a good influence on John. (Is there an echo in here?) But the influence worked both ways. Frank says he learned from John that there was much more to life than he, Frank, had experienced. Not just those raids on the dining hall that Carl has mentioned. Frank tells me John (and John Cavallo, he thinks) used to “borrow” the tractor (the tractor!!) late at night, drive it down to the valley, and bring back six-packs of beer. Inspired by John, Frank became more adventurous, and snuck off one weekend to visit his girlfriend, who was a freshman at Smith. As you no doubt recall, Frank got caught (coming back) and was suspended for a couple of weeks. But he has no regrets; rooming with John was “enlightening,” he says. As a “new kid” in the class junior year, John quickly worked his way into our affections. He was friendly, outgoing, always seemed happy, and he was funny. He seemed to have a wry, humorous take on just about everything. I remember he was a smoker and used to joke a lot about all the crap he went through to feed his nicotine addiction (i.e., freezing out in the cold down the lane, back before the Class of ’61 built the smoking shack as their class gift to the school.) And he could do some outrageous things. He was uninhibited, fearless or crazy (take your pick) at times. By senior year, John was one of the most popular guys in the class. He was a wonderfully talented musician, and the jazz band, which included John on banjo, Carl Sharpe on piano, Ed McIlvain on guitar, my brother David on drums, and Steve Foote on just about everything else, was an enormous hit, whether playing at school meetings or jamming in the music room in Wickersham. Everyone liked John and he seemed to get along with everybody. This photo from our senior year yearbook shows John working on what looks like a disassembled car engine. As I recall—others may want to help me out here—this was one of John’s Hands-to-Work assignments. He and a couple of other guys rebuilt an old truck engine that was used that winter to run the rope tow on the ski slope. As I also seem to recall, it used to break down a lot, so there was a need for ongoing maintenance. John enjoyed hands-on work and apparently he was a pretty skilled auto mechanic, at least for an 18-year-old. Darrow also had the intended academic effects on John. As graduation neared, John was headed to Cornell, a great path to future success. When we all dispersed to college, I lost touch with most of you, including John, for a few years. 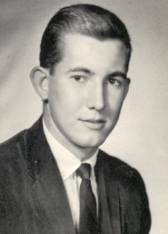 In 1968, Jack van Vorst asked me to take over the job of Class Secretary, and I was supposed to contact you all at least once a year. Living out in California where I was in grad school, I missed you guys. So I started collecting news, and putting out a class newsletter with the results. The newsletter proved popular and John was one of the most enthusiastic about it—he loved to read about the rest of us and was generous and open about sharing his own life with us. Over the 14 years that I did those newsletters, John sent me many long and candid contributions. His letters (and the other news of him in the newsletters, based on phone calls or in-person encounters) enabled me to write this rather selective and Darrow-centered biography. Skip ahead to 1971, and John and Kris have bought a second home, an old farm house in upstate New York, near Ithaca. He’s still working for Rouse in Baltimore, moving up in the company ranks, heading a team developing shopping centers, but “sort of working up to quitting,” thinking about moving up to the farm full-time. 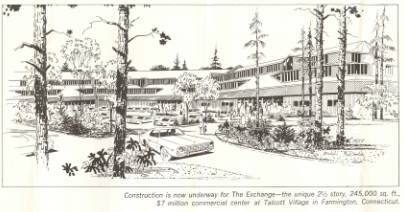 Two years later, in 1973, John wrote to say he indeed did resign from Rouse, at the end of 1971, to start his own real estate development company. 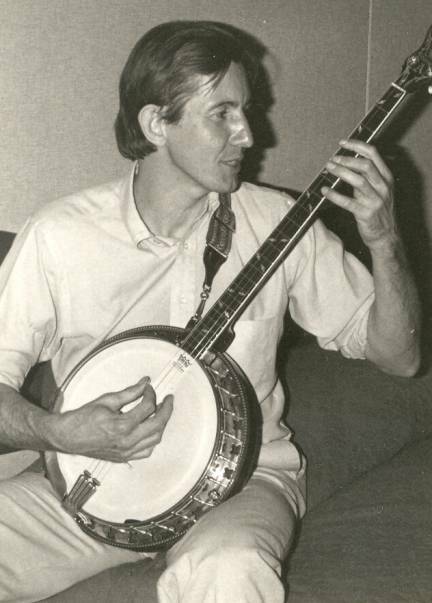 He took pottery courses at the Maryland Institute of Art, opened a small pottery shop, and was doing real-estate consulting and playing banjo to earn some money. He helped set up an arts-and-crafts school in Columbia, but by late 1972, feeling frustrated with his efforts there, he and Kris decided to move closer to their farm. After a couple of jobs that didn’t work out, he and a friend formed a commercial real estate consulting firm. They were developing The Exchange, in Farmington, CT. John was living there, while Kris and the girls (Jessica arrived in 1969) were up at the farm; he commuted on weekends. They had moved three times in two years, and were aiming to settle down near their New York land. Three years passed before I heard from John again. In 1976, he wrote that he had been “suffering in the gloomy upstate New York climate” for the past four years and was ready for another change. He was still developing malls, but lately had been putting more of his time into creating stained-glass weathervanes, and had gone into business with his brother Bard, selling their artworks through outlets like Hammacher Schlemmer and Nieman Marcus. Kris was now working as a human relations trainer and as her career grew, John was taking on a greater share of the housework, parenting, etc. Jennifer, now 9, was a star in school and (John thought) starting to act like a teenager already. Jessie was 7 and John said she took after her father—didn’t like school, got bored and got into trouble trying to stay entertained. 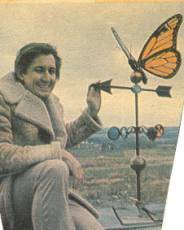 Our first newsletter with photos included John perched on a roof with a stained-glass butterfly weathervane he had created. That same year, John, Kris and the kids did indeed move again, to California, where John became a VP for marketing and real estate for the Borel Corporation in San Francisco, which operated a chain of restaurants. In the fall of 1976 I went to California on business, visited with John and met Kris and the kids for the first time. My marriage was dissolving at that point and I was into talking about it, and learned that John and Kris’s marriage was coming apart as well. In the next few months John quit his job with Borel and moved to the San Diego area, where he was re-habbing another shopping center. He was living in a condo right on the beach, building a house, flying up to SF often to see Kris and the kids, while trying to adjust to a bachelor life. Some “crazy” things happened in this time…he rolled over his Porsche, totaled the car but walked away. He had stopped smoking, taken up running on the beach. He missed the married, family life he’d had a year before and was hoping his new lifestyle would age and mellow a bit, like good wine. Since we were going through a lot of similar life-dreck at that point, I talked to John a few times in the next year, and to Kris as well, once or twice. It was a turbulent, rough year or two, in which John said he often swung from happiness to despair, and felt he had a long way to go before things would come up roses again. He had been putting most of his creative energy into inventing, and told me he was getting involved in some “pretty far out political things,” too. He was building a couple of houses, still consulting for Borel, and enjoying an active love life, but predicted he’d never risk marrying again. The next time I caught up with John it was by phone, in March of 1979. He was then living in Vista, CA, sharing a house with some guitar-playing, boat-building carpenters and a “crazy Indian dynamiter,” and “trying to get his head together.” John’s self-analysis was that he was going through what many people had done in the ‘60’s, when he’d been too busy being successful at real-estate to indulge in it: I.e., experimenting with various lifestyles, doing drugs, self-discovery, living out fantasies. His life seemed constantly in motion. He’d toured all the national parks of the western US and Canada in a mobile home with a woman friend; spent time in Mexico and in upstate NY; was planning a trip to Yucatan with his housemates; hoped to travel around the world some day soon. He still intensely missed being with Kris and the kids but was trying to make the most of his freedom. During the next year or so I heard from John several times (including one note scribbled on the flap of the Annual Giving return envelope). His life sounded as exciting as ever, but increasingly turbulent. After his trip around the world, he spent the summer with his daughters on the farm in NY, then relocated to Palo Alto, CA, to be near Kris and the kids. He was looking for work, hoping to get into energy conservation, seeking to turn his years of “spacy contemplation” into some patents for useful earth-friendly inventions. He was sharing a house with a policewoman (strictly business, he said) and looking for “a little more stability in my life.” He felt he was at a major turning point—no job, almost out of money, still apart from his family, and feeling pulled in all directions by his many interests, hoping to choose a concrete path in the near future. He wasn’t dating anyone, and still seemed to be hoping to get back together with Kris, despite her different wishes. Kris was working with heroin addicts in a county drug rehab program, had grown stronger from going through the divorce, and was moving on with her life, while John seemed (to me) to be going in circles. In one of his notes, as he thought about his “spaciness” and how that had seemingly cost him the chance to be with Kris, John tossed my words back at me, saying “Sometimes the agony outweighs the ecstasy.” He was also “intensely frustrated by [his] inability to find a niche where I can perform a valuable service to society and simply enjoy my family again.” He described himself as “brokenhearted.” At his request, that honest pain never made it into the newsletter. Late in 1979, I moved to New York to work for Consumers Union, and I got together with John again around the end of 1980. He was then living in upstate NY, and Jennifer and Jessica came from California to spend some time over the Christmas holidays in NYC with their dad. The day before they arrived, John (and a very appealing young woman he was with at the time) stayed with me. We had a nice dinner at a local restaurant then stayed up most of the night, sharing memories and life stories and making music (taking turns playing my guitar). John seemed happy again, still trying to figure out what to do when he grew up, and enjoying life one day at a time. 1982 arrived, and I began organizing our 20th reunion, which was to be our biggest and best to that point in our class’s history. Though I had a hard time reaching John, he was living in upstate NY at that time, and he made plans to come. That was the year, you’ll recall, that we rented all the rooms at the Queechy Lake Motel and took over the place as our reunion headquarters. Friday night was a wonderful party, with about 10 of us and our wives and assorted others there, getting reacquainted with folks we hadn’t seen for up to 20 years. There was singing (Carl and Howdy doing half of a barbershop quartet), and John enlivened the party with his banjo. As I perceived it, it was the mellowest of times—no matter where our various paths had led us, what seemed to matter was what we had in common from our days at Darrow. I experienced that evening as a loving, happy event. But John didn’t. When we gathered at Darrow the next morning, he was gone. He’d just slipped away during the night. He felt bad about that, and sent me a letter a few days later to explain why he had left so abruptly. About a year later, in a phone conversation, he told me more about his emotional condition at the time. He said that—despite his outward joy and great contributions to the celebration—he’d been in really bad shape. He felt he was at a low point in his life. He had no job, was almost broke, living with his father, sleeping on floors, had no clothes, had had to borrow his father’s car to drive over for the reunion. He’d stopped to see the house where he grew up on the way over to Darrow (that lovely house in the woods Carl described in his memoir), and it had burned down, nothing was left. When he arrived at the school Friday, he’d been depressed by the appearance of the campus (peeling paint, damage to walls and furniture.) He had felt unwelcomed by the current faculty he met, was unfavorably impressed by the head, David Miller, and seemed convinced that the Darrow he had known and loved was gone forever. He reflected on how much of his own efforts he had lately been putting into protesting and trying to change the world for the better, and yet, at that point, it looked to him as if the world was going downhill in most important respects, and he seemed to be wondering what the point was of trying any more. He sounded like someone striving desperately to hang onto hope, and unsure he could succeed. At the reunion, he’d gotten the feeling that everyone else’s life was a success while he’d made a wreck of his, and he just had to run away. On the phone, I asked him if he hadn’t felt how much we all loved him, how talented and creative we knew he was. But he hadn’t been receiving those vibes at the time. When we talked on the phone, in July of 1983, John was in much better shape. He was back in Columbia, MD, working for Jim Rouse again, directing several major projects, running a development foundation for the poor and directing leasing for one of the Rouse Company’s divisions. He was living on the same street (but in a different house) that he’d lived on when we had heard from him in 1971. Jessica—now 13—was living with him, while Jennifer and Kris were still in California. John had sworn off having a love life for a while, saying he had known many delightful women, but was concentrating on family and work for now, and waiting for someone to really sweep him away. I heard from John several times over the next year or so. He was enjoying his work and traveling a lot, including many trips to the West Coast to see the kids (Jessie was back in CA by then). He was putting some of his energies into political causes—mostly writing letters to editors, at that point. One he shared with me complained about militarism, the depletion of resources, environmental degradation, the persistence of poverty, the lack of truth from political leaders. (This was the Reagan era and a lot of us were feeling pretty alienated from government at that point.) In one phone conversation I had with John, he was going on and on about his ideas about how to save the world, and asking me how he could get an article he’d written about that published. I admired his passion, but I didn’t have the heart to tell him, I thought his ideas were grandiose and mostly impractical. He seemed to be in a manic phase, totally energized and absorbed with his own thoughts, but not seeing things especially clearly. I’d known John to be a little like that sometimes, but the oscillations seemed to be getting wider. Not long after that, John took part in a protest at a nuclear submarine base in Norfolk; as he described it to me, he was “protesting the launching of one of Frank’s submarines.” (Frank Rosenberg’s father’s company, for which Frank worked for many years, made optical and hydraulic parts for, among other things, nuclear submarines.) John was arrested, I believe for chaining himself to a fence, and that, coupled with his recurrent instability, cost him his job with the Rouse Company. I lost track of him for a few years, catching up again in 1987 (via another Darrow telethon). By then, John was back in California, living in La Honda (in the hills behind Stanford), working as a carpenter and potter, playing music occasionally. He told me Jennifer was a junior at Berkeley, taking courses in creative writing and rowing crew. Jessica had been president of the choir at Palo Alto High School and was headed off to UC Santa Cruz, planning to major in music. Kris was still living and working in the area, and it was painful for John to be around her and aware of her but not with her, a constant reminder of one of his biggest failures, as he saw it. I told him to let go and move on, but a decade after the divorce, he still hadn’t. Later that spring, Sharon and Sarah and I were in California for a short trip, and we drove down from SF and had a brief visit with John. He was happy to see us but seemed tired, remote, almost burned out, and we parted after just an hour or so. John then dropped out of (my) sight for a number of years. I had stopped doing ‘62 newsletters several years before, as parenthood and increasing responsibilities at work consumed more and more of my time and energy. Our class network thinned out a bit as a result. 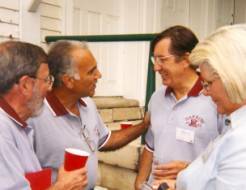 When our 30th reunion was approaching, I made an effort to locate some of the “lately lost” guys, and talked to John’s brother, Bard. But my efforts to reach John and lure him to the reunion came to naught. Nonetheless, John was aware of them, and in August of 1992, he sent me a nice long letter. He was living at and managing the Irondequoit Inn, an Adirondacks resort on Piseco Lake, NY. He invited me to bring my family there for a vacation. He confessed to having been quite “reclusive” for some time, but said he was feeling “ready to get back into the mainstream again.” When I got his letter, I called him, and we caught up some more. He had a fiancée (as he put it) who lived in Westchester County; she was 20 years younger, an artist and teacher who shared his love of the wilderness. He described himself as “dirt poor” but said he was renovating (yet another) house, and thinking about moving to Ithaca. His daughters were grown up: Jennifer was working as a paralegal in Silicon Valley, planning to go to UC/Hastings law school. Jessica was in Prague, working for a software firm. With his lady living just 20 miles from me, we hoped to see each other again soon. But that didn’t happen, and I never spent any vacation time at the Irondequoit. I next talked to John a couple of years later, probably during another Darrow fundraising telethon. (I always used them more to gather news than to ask for money.) He told me he was about to move to Santa Fe, with a bunch of friends from California. He planned to rent a ranch, and live out in the desert by himself, working as a potter. He was still trying to patent inventions to solve energy problems, but hadn’t made any breakthroughs there yet. He and his fiancée of a couple of years earlier had broken up, and he was without constant female companionship. He had been out of touch with Kris for several years, and finally seemed to accept that as best. He said he and Bard were not on such good terms any more, but I could call Bard, or their Dad, if I needed help finding him again. He told me the farmhouse he and Kris had owned near Ithaca many years before had been struck by lightning, and had burned to the ground. John wrote me again in early 1997, when I was trying to drum up interest for our 35th reunion. I had sent him our ‘96 family Christmas newsletter and I got a nice long letter back from him in January. It included a photo of “our new home in NM” which showed that it really was out in the desert, with lots of sky and mountains. Brigitta was a fellow artist, a native of Germany, whom John had met on a trip to Mexico. I gather they were married by this time, but John didn’t fill in that blank. He said that they were building a studio out there among the sand and sagebrush, to work and live in until they had the wherewithal to build their planned straw-bale house. Both of them were making a living as potters, selling through galleries in Santa Fe and Taos, but John was still inventing and looking for that world-changing patent. He said their studio was “unique,” energy self-sufficient, designed somewhat like the Taos Earthships. He said they were “cozy” but at the mercy of the weather, six miles down an un-maintained road. John updated me on his daughters: Jennifer had passed the California bar and was working in the legal department at Adobe Systems. Jessica had married a nice, bright Czech computer programmer she’d met in Prague, and they were living in Mountain View, where Pavel was working for a software company and Jessie was in law school at UC/Hastings. “Two daughters who are lawyers—where did I go wrong?” he wondered, in mock dismay. 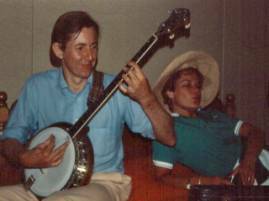 John said he was playing banjo in the Santa Fe Chilies jazz band, and they traveled around the West doing gigs. He said it was the best band he’d ever played in and it was a joy to be playing again after a seven-year hiatus. John and Brigitta had met many of the Santa Fe community’s creative people and artists, through their work and his music. They’d made a trip to Austria, Bavaria (where Brigitta came from, a ski resort in the Alps), and Berlin. The letter was wonderful news to me. John sounded so happy and it seemed his life was back on a solid track again. I was hoping we’d meet Brigitta at our 35th reunion. John also sent me an essay he’d written, an impassioned screed about the human race’s responsibility for planetary decline and the religious roots of environmentalism, which he asked me to give to Sharon, in hopes Newsweek would want to publish it. That essay struck me as sincere but amateurish, an opinion I’m sorry to say I shared with John when he called to ask me if I could persuade Newsweek to run it. That hurt his feelings; he felt the essay was one of the best things he’d ever written, and I wish I’d kept my criticism to myself and given him more positive feedback. (If anyone wants to read his essay, “Earth Speak,” I have a copy.) That exchange told me John was in a manic phase again—but for the most part, he sounded great, and it was nice to have him back. John and Brigitta didn’t make it to the 35th reunion (just seven of us did, I put too little effort into organizing it.) But around then most of us were getting wired to the internet and e-mail became my preferred way of keeping in touch. In 2000, I got my first e-mail from John. He was about to launch Adiri, a company set up to make and market a new baby feeder (a bottle shaped and textured to feel like a breast; this illustration is from the company web site). John had patents in this line of products going back to 1991 and was about to put the feeder on the market. He e-mailed me about it at CU, hoping Consumer Reports might publish a favorable report on his product and help build market demand for it. (I had to reply that CU didn’t work that way, but I was enthused about the product and wished him success.) But the same e-letter brought awful news: Brigitta had been diagnosed with stage IV ovarian cancer. She was responding well to surgery and chemotherapy, but they faced an uphill battle. 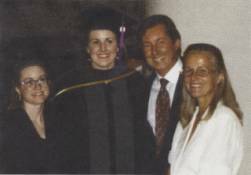 Attached to the e-mail was a photo—a couple of years old—of John, Brigitta, Jennifer and Jessica at Jen’s graduation from law school (the one reproduced above). Jennifer was now working for Yahoo, while Jessica, who had just finished at Hastings, was a newly-minted corporate counsel with Arisasoft. For the next several months, John and I exchanged e-mails at regular intervals; it was like an extended conversation, not like our earlier mode of catching up after years of being disconnected. I learned that he and Brigitta had moved to Pamplin, VA, about 10 miles east of Appomattox. They’d bought a converted grist mill and house, sold their property in NM and put the proceeds into their company. John shared with me the many ups and downs a small businessman endures as he tries to market an innovative product, and we chatted about some of the little day-to-day things that were going on in our lives. John got an e-mail from God (actually from doctor/author Bernie Siegel, a shareholder of Adiri, posing as God), telling him not to worry, everything would be all right. He heard from the NY chapter of the Mayflower Society that an old family myth—that they were descended from Elder William Brewster of the Plymouth Colony—which John had long dismissed as fiction—was actually true. We shared our sorrow at the news that Scott Leake had been diagnosed with ALS, and collectively mourned the continued destruction of the global ecosystem. John wanted to get back in touch with John Cavallo, and (using an e-mail address I gave him), did so. He said he was trying to persuade John to come to our 40th reunion (even though John C. had turned out to be a Republican). John said his brother, Bard, had retired from his teaching job and was still living near Ithaca. John mused that over the 30 years or so that Bard had been living in the same house, he (John) had lived in six different states (some of them several times) and countless houses, and had lived at least as many different lives. He said his personal journey had been like a roller coaster, but “the exhilaration usually outweighs the fear, in the balance.” He confessed that he found life hard sometimes, but passed on some philosophy he’d picked up from Bernie Siegel, that we should be thankful for bad times as well as good, and wished he had learned that lesson earlier in life. During this phase of our correspondence, John seemed back “in the zone,” solidly grounded and centered, and as focused and content as I had seen him in a very long time. The black cloud hanging over them, of course, was Brigitta’s cancer, which inexorably stole away her vitality, then her life. We all heard from John once in 2001—he joined in the political banter to take my side in one of those pointless arguments I was having with the Republicans among you (you know who you are). In passing he let us know that Brigitta was dying and his full-time focus was taking care of her, letting Adiri business slide while he tried to make her final weeks as bearable for both of them as possible. Through his pain, his political idealism and his belief that the human race can and must do a lot better shone bright. 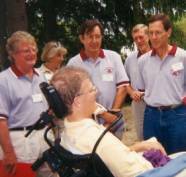 As the lead-up to our 40th reunion gained momentum I was in touch with John (and with all of you) often, sending out multiple bulletins. In March of ’02, John e-mailed back to say he was hoping he could come to the reunion but not sure he could make it. He was having big ups and downs (mostly with the business, I think he meant) and didn’t know if he could afford to take time away from it. He passed on some joyous news—Jennifer was expecting his first grandchild around the time of our reunion. But he might want to be in California rather than at Darrow. I told him the baby could wait a week to see him and urged him to come party with us on the mountainside and recharge his batteries. John’s next e-mail upgraded his intentions to “probably will come.” And he did. John showed up on Saturday morning and left that evening, but he enjoyed being there and we were all delighted to see him again. And he shared the news with us that he’d met this wonderful woman on the internet, and was soon going down to meet her in person, in Georgia…. Over the next several months, we heard more about Katie, and John shared pictures. He was clearly smitten, and I was happy that he’d fallen in love again. In August of ’03 John sent me word that he and Katie were married, the month before, out in Santa Fe. They were planning to settle in Asheville, NC. He had sold his farm in Virginia and turned Adiri operations over to a friend in Santa Fe, and he was feeling much relieved at having unburdened himself, easing into semi-retirement. For the next several months John seemed to be bouncing around. One e-mail said he was in New Mexico but didn’t say much else. Another told me he and Katie were living in Rabun Gap, GA, not Asheville, and two more gave me two different new addresses, as he/she/they sold one house and bought another, then another. A message in the spring of 2004 told me that John and Katie were having a turbulent time—breaking up and getting back together more than once. He wasn’t explicit about it, but their marriage had lasted just two months, and they were now apart, but trying to see if they could make it work again. The last time I heard from John (we all did, I passed his message on to you via the class e-mail list) was last September, when he wrote that he and Katie were together again, living in a wonderful house overlooking a valley, which they were renovating (a task he never seems to have tired of). He sent us photos of Katie, the view from their house, and his new Kawasaki 1500cc motorcycle, “the best toy I ever owned.” He said, with obvious pride and approval, that Jessica had dropped out of the corporate world and was going back to school for a master’s in teaching, and that Jennifer was expecting his second grandchild in December. He was looking forward to an autumn trip up to the Adirondacks, and described himself and Katie as “happy, healthy and enjoying life from as many angles as possible.” It sounded as if all was well and he had shed most of his troubles and found some measure of contentment. In December of 2004, Jennifer had her second child, a daughter, Lila, and John flew to California to spend several days around Christmas with his grandchildren, Jennifer, and her husband. She said he seemed in a manic phase, but he was very upbeat, and they had a good visit. Jennifer sent this picture of her kids—Ronan is going on three now—taken in March, 2005. But then, last month, Jennifer’s e-mails and the attached news stories told us John had taken his own life. His house burned down, from a fire of unknown origin, with him inside, apparently having shot himself in an upstairs bedroom. I’m still stunned and trying to come to terms with it. Over the years I had realized he was suffering from bipolar disorder, but I had assumed, hoped, he was strong enough to beat it. I guess not. I wish I had reached out more often and more assertively, to tell him I’d be there to help pull him back to the center if at times the downswings seemed too much to bear. I wish I’d known how unstable things were with Katie and how hard that would be for John, but this time he didn’t let on that things were going badly. And all my coulda/shoulda/woulda’s change nothing now. I needed to get John’s life as I experienced it down on paper, while our memory of him—and the pain of our loss—is still fresh. I wish dearly I could’ve done something to deflect that final, fatal impulse, and I hope we may all learn from John how hard it is to recognize, and deal with, the disease that ultimately defeated him. As I rediscovered his past letters, I was struck by the foreshadowing: Two previous homes with great meaning for him, his parents’ house and the farm he and Kris owned in their early, happier days, were both destroyed by fire, and he eerily predicted his own destruction by speaking of his future, final love affair as “spontaneous combustion.” It almost sounds as if John had thought about his exit scene for a long while, and chose an end that resonated with other important events in his life. I’ve read few novels with such powerful symmetry. John was blessed with all sorts of talents. He was one of the most extroverted, creative, artistic, loving, open, genuine, emotionally vulnerable individuals I’ve known. He nailed his own history with his 2000 characterization of his life as a roller coaster. So many ups and downs. So many painful lessons learned more than once. But there were so many highs, and so much good he accomplished. His real-estate work enhanced many local landscapes, and helped forge new societal ideas of what towns should look like. He created a product that lives on, and may ultimately change the world of infant-feeding devices. His music brought joy to thousands, and his pottery and stained-glass creations added beauty to innumerable individual homes and lives. He and Kris (mostly Kris) raised two talented, accomplished daughters who have begun passing on some of his talents to another generation. While the women who mattered most to him were the ones he loved and lost, he enriched the lives of many others (many more than he ever told me about) as well, even if only briefly. His political activity frustrated him because he was not able to effect change, but his ideals were strong and deeply held, and in our hearts we know the things he cared passionately about were the right ones. The joy John created and the good times he had and shared with the rest of us were so intense, and so plentiful, and his willingness to embrace life was so unstinting, that I frankly was often envious. As long as we’ve known him, John was never afraid to take risks—sometimes, not as afraid as he should have been—and while many times he soared, he also crashed on more than a few occasions. He always seemed to pick himself up, dust himself off, and leap again into the unknown. I might have thought he was infinitely resilient; but no one is. I was astonished by his frequent sense that his life was a failure, and yet felt powerless to contradict him. My gentle efforts to reassure him simply bounced off. The depths of his pain, which I glimpsed now and then, were scary, but he’d always seemed to claw his way back up out of the black hole. I am so sorry that he couldn’t do it this time. I will miss him terribly. Our class has lost a big part of its heart.